As well as eliminating static and giving the fabric more support, I thought backing it with calico would make it more comfortable against the skin in summer – this polyester stuff* is quite plasticy! I preshrunk the calico in a hot wash, then cut it to the pattern piece. It is best to cut the shell and underlining together so they are exactly the same, but of course my outer fabric was already cut. Because it had already been sewn up, and clipped, and pressed, and unpicked, it could also be slightly distorted, so I took the calico to be the correct shape. I machine basted my underlining to the shell, one edge at a time. Purists will say this must be done by hand, but I’ve never found that necessary. 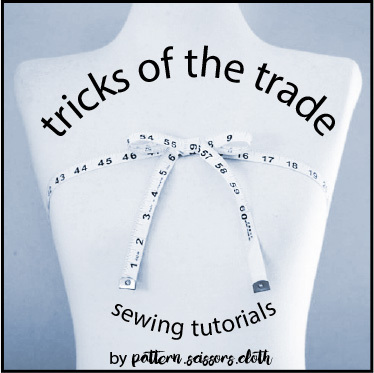 But you probably already know I question a lot of things in sewing books! 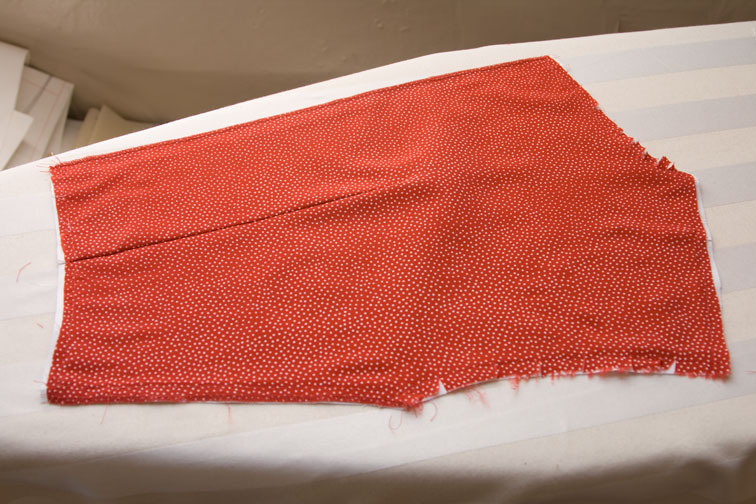 The dart was sewn before basting the edges together – first baste the two layers together up the middle of the dart, then sew and press the dart itself. This means the cloth allowance around the dart is accounted for before you start on the outer edges. 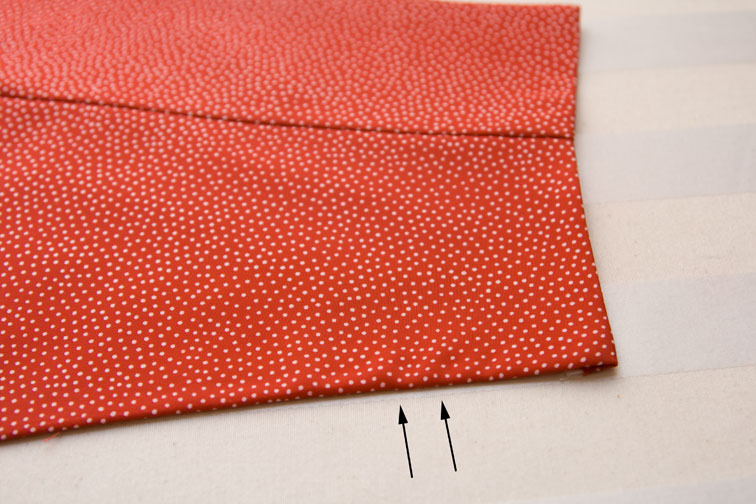 Next I sewed the CB edge, then the side seam/armhole with the fabrics folded lengthwise – this gives you the cloth allowance needed when the seam allowances are turned back. You will notice that the raw edges don’t match exactly – that’s the idea. Then I basted the waistline, followed by the neck/shoulder, in the same way. 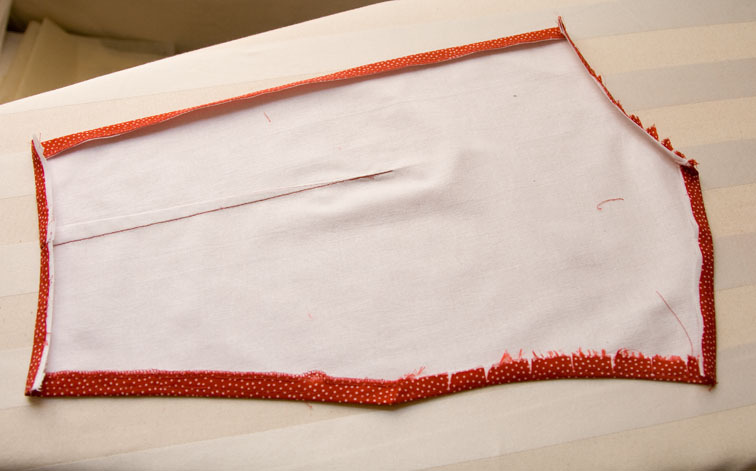 Usually some areas, like the corners, need unpicking and rebasting – just listen to the cloth and do what it says! It’s a bit hard to see, but in the above picture there are a few stops and starts where I’ve ripped and reset – that’s OK because the stitching all gets removed in the end. That’s why you’ve used a long stitch length and didn’t backtack – oops, did I not tell you that earlier? – hehe! The right side should show slight looseness, evenly all over, to allow for the cloth folds and body curvature when the garment is sewn up. You’ll see that some cut edges don’t match – that’s OK, the important bit is that the ease in the shell is correct. …and in the competition between me and this dress, I am going to win! Just like the All Blacks!!!!!!!!!! Today’s Victory Parade – I was one of the 270,000! Some fabrics are easier to work with than others – this polyester is non-forgiving, but the washed cotton presses to shape well. Together they are quite compatible and I am liking the resulting fabric. This is what underlining is all about – changing the properties of your fabric to be more suitable for your design. In making my Totally Unnecessary Cocktail Dress, I even underlined the stretch satin with silk organza to eliminate the unwanted stretch. That’s all for today – do you have any favourite underlining tips to add? Do you swear by hand sewing your underlining to the shell – or do you get just as good results by machine? And what is your favourite underlining combination? 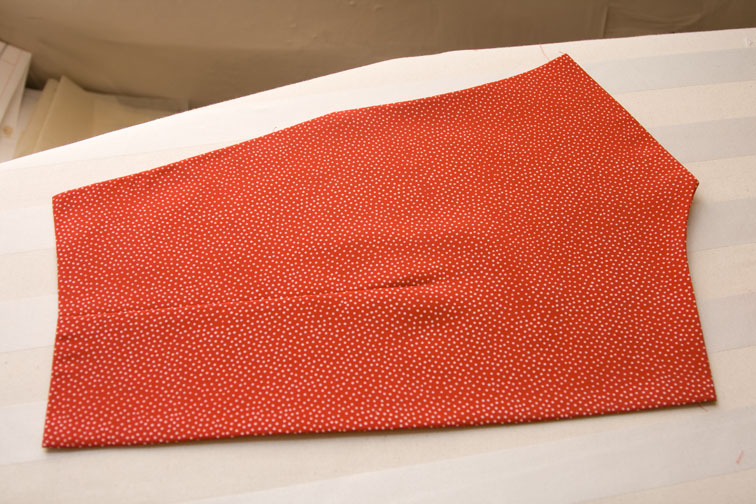 *Can you believe this fabric is from my very first job in the garment industry?! My employer used to allow us to have the roll ends – unfortunately they made what I used to call “old ladies clothes” (notice I don’t call them that now – lol!) so there weren’t a lot of suitable choices for a 24 year old. But I did acquire this piece and later gave it to my mother. However it sat in her sewing cupboard for years, until I reclaimed it last Christmas. What goes around, comes around – it’s very true! Go All Blacks – as a South African I'm sad we got knocked out, but you guys definitely deserved to win. It was touch and go for a while there – a nail-biting final! As for the underlining, I recently underlined a silk dress. But all hand-basted. Urgh. Next time I'll definitely use the machine. I use an industrial but feel that the hand needle still gives me more control for basting. I am jealous by how wonderfully you do it by machine! I can't wait to see the re-finished red dot dress, and your self-challenge has definitely inspired me to retackle some of my past failed projects. Thanks for all the tips you offer on your blog, especially the reminders about cloth allowance that I sometimes (foolishly) forget. Greetings from San Mateo, CA! 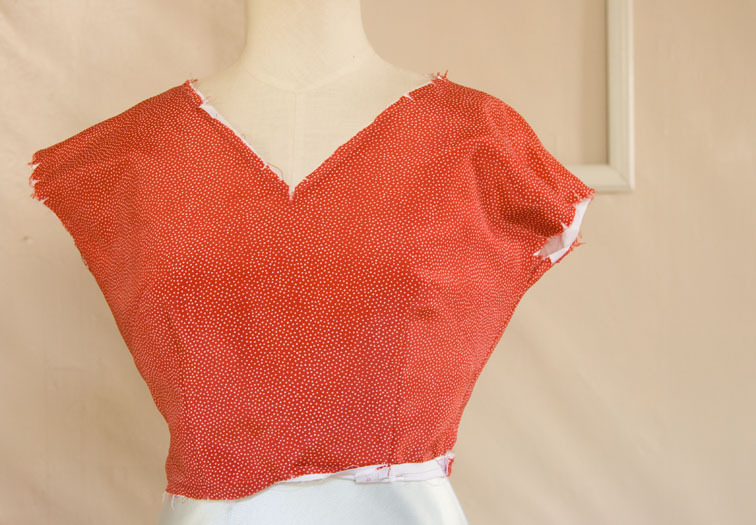 When I saw the boo-boo bear of the “first” red spotted dress, I immediately thought “underlining.” I'm sooooo thrilled it's making all the difference in the world for you in its rescue. WISH I could wear red– I loathe it on me as a redhead. Can't wait until your dress is on you! It's going to be worth all of this. Your dress is looking nearly as good as the All Blacks! I admire your tenacity in making this dress work. A lady of grand Patience you are! These are the qualities we attempt to imprint on our children:) That said, I tend to test an underlining by machine before committing to hand or machine. If the needle doesn't pucker the seam and if there are not waves along the seam line, I do it by machine. The conflict tends to occur for me when using a natural and a man-made fabric. Two natural fabrics marry very well. So I guess the short answer is “it depends!” When hand basting, I always use silk thread. By machine, I use an all purpose poly/cotton blend. Your new and improved bodice looks better and will certainly be more comfortable. recently I was working on a silk dress, hand basting silk organza underlining and about half way through I got fed up and just machine basted the remainng bits – worked fine and saved tons of time. I never though of underlining with cotton like this (except on wool coats I have done). Always learn so much from your posts. thanks! and cheers for your team, saw the opening of the match on TV here in Calif. including the great hakka. I was just wondering how I'd underline a flimsy polyester fabric I have. Thank you SO much for this inadvertently timely post! Am currently making a linen dress and have underlined with cotton voile. I used the max stitch length on my machine and it worked fine. Haven't sewn it as a final yet – fitting today. Great post!!! 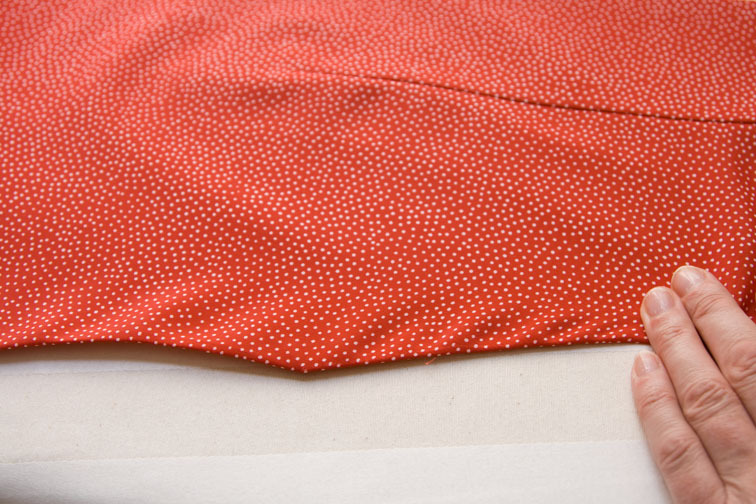 This dotty dress will be gorgeous when it is done. Good on you for all that unpicking. This is a very useful post. Next time that you are underlining a bodice, could I trouble you to take photos as you are sewing, as I am not entirely clear on which way you are folding when basting the 2 layers together. I'm guessing that you are folding with the wrong sides facing in? Thanks for your advice on adjusting my slip at the empire line and not just adjusting the strap length…I would have just adjusted the straps but I can see that you are right. Please don't ever hesitate to provide constructive criticism on my blog for fear of offending…I have never had a lesson and learn so much from the blogging community. Great win for the All Blacks! I love underlining. I'm actually underlining a cotton jacket I'm working on at the moment. I machine basted everything. I usually underline thinner cottons with a white cotton to give them more body and make the colour 'pop'. I'm sure your dress will look great when it's done. Unpicking everything can be a pain but worth it to fix things. Wow, you are superdetermined with this dress. i would have given up long ago. I love the idea of underlining polyester to make it more wearable. I always run away if I see polyester but underlining is a great idea. I love the little irregular dots in your dress! 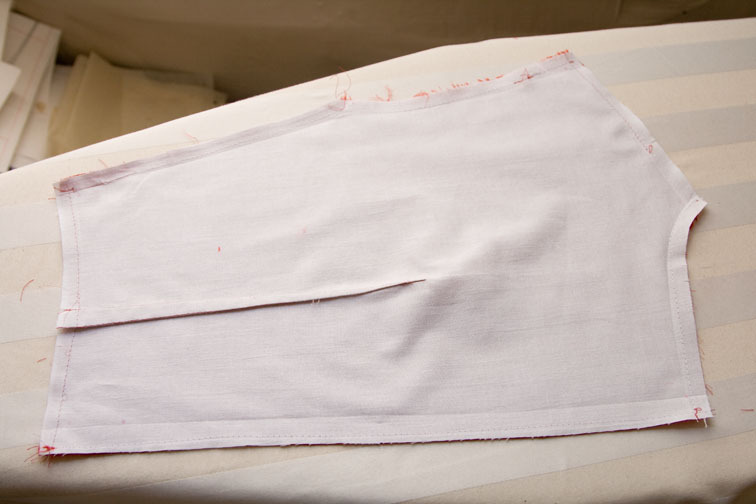 Sherry, I've always wondered, as a newbie to underlining, is there a reason you would underline with muslin, as opposed to fusing with a fusible? They both seem to serve the same function, no? You are such a trooper with this dress! I'd have tossed the nasty polyester in the bin by now, I'm sure. That being said, my only non-traumatic experience with chiffon (or maybe it was georgette… I don't know my light and floaty fabrics very well, as I tend to avoid them) involved underlining. And lots of hand-basting, mostly out of sheer terror. I think adding it to this dress was a very, very clever idea. I always learn something from reading your posts – cloth allowance, who knew?! (well, probably many people, but not me!). I'd like to second Katherine H's request for photos for that folding bit though – I can't quite visualise what you mean. Yeah for the all Blacks. My daughter In Law to be is a New Zealander so I am very pro NZ . We are coming across the ditch for a 2 week holiday around the South Island in early December . So looking forward to see it . Your underlining is really a good idea . i use underlining quite often and find that it is so good for lifting a ho hum fabric into a much better product . I have just made a coat which is made out of a metal threaded polyester and underlined it in flannelette . It looks so good with body and is much warmer .than it would be otherwise. katherine h – Yes, I am folding wrong side facing in, hopefully I've made that clearer in my next post! I'm glad you appreciated my comment – I'm always a bit concerned I might offend even though it is never my intention! Stephanie – Run, Polyester is good advice! Marina – I know you're a purist!! But even I would do guipure by hand! Reethi – I chose muslin for the comfort-next-to-the-skin factor. I wouldn't choose a fusible for the front/back pieces of this particular dress because of the drape at the underarm, and it is not as nice next to the skin. For a lined fitted bodice I might though! mem – Enjoy our beautiful South Island! 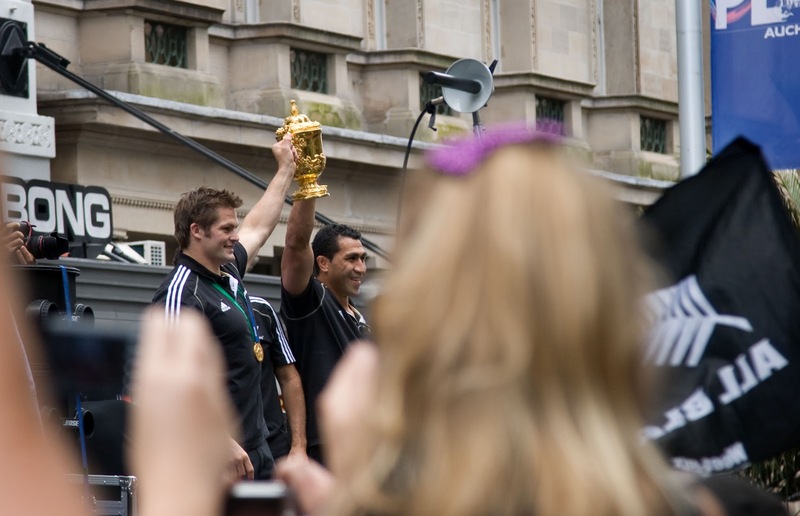 Very very interesting and very admirable – YOU WILL WIN – and congrats to the All Blacks! I recently discovered your blog through these instructions on underlining – thank you! These are so clear which is great for a beginner like me. And I'm relieved you suggest machine- rather than hand-basting 🙂 Looks like you have plenty of other interesting tutorials as well which will help be learn – fab!